Burberry’s new collaboration with Kris Wu has translated into a new advert, featuring a selection of his favorite pieces from the new collection. 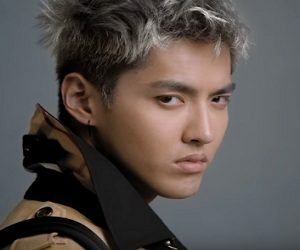 In the 30-second spot, introducing “The Kris Wu Edit”, the Former Boy Band Superstar Member, now also Menswear Model, sports five distinctive Burberry looks, which can be bought online, from the brand’s website, including the Regimental Coat, the Deconstructed Cotton Gabardine Heritage Trench Coat, the Large Rucksack in Technical Nylon and Leather with the Punk Thomas Bear Charm and Crown Key Ring in Leather, Oversize Check Cashmere Scarf, a Check Cotton Flannel Pyjama-style Shirt, Sports-striped Cotton Blend Sweat Pants, and Sports-striped Wool Sweater. The track used in the ad is “Digging (Live)” by Isaac Gracie.